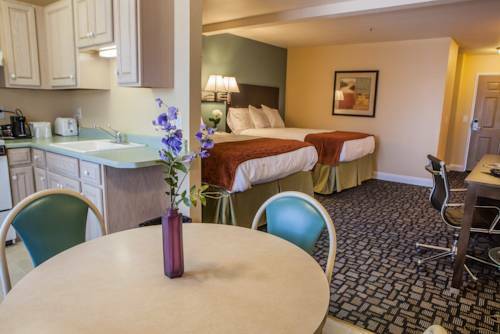 Marinwood Inn and Suites in Novato California is nestled in a serene Marin County neighborhood bordering Wine Country with an abundance of attractions accessible in every direction. Our non-smoking guest rooms and suites welcomes families vacationers and business travelers featuring free Wi-Fi complimentary breakfast outdoor heated pool an on-site restaurant guest laundry facilities and all the modern conveniences and services that will accommodate both your overnight or extended stay visits. The Buck Institute for Research on Aging 1 is the United States first independent biomedical research institute devoted solely to research on aging and age-related disease. The mission of the Buck Institute is to extend the healthspan the healthy. Muir Woods National Monument is a unit of the National Park Service on the Pacific coast of southwestern Marin County California 16 miles of Novato and part of the Golden Gate National Recreation Area. It protects 554 acres of which 240 acres. Napa County is a county located north of Marin and is officially one of the nine San Francisco Bay Area counties. Napa County once the producer of many different crops is known today for its regional wine industry rising to the first rank of wine. Point Reyes is a prominent cape and popular Northern California tourist destination on the Pacific coast of northern California. It is located in Marin County approximately 24 miles south-west of Novato. San Francisco is a popular tourist destination 18 known for its cool summers fog steep rolling hills eclectic mix of architecture and landmarks including the Golden Gate Bridge cable cars the former prison on Alcatraz Island and its Chinatow. Six Flags Discovery Kingdom is a 135 acres animal theme park located in Vallejo California. The park includes a variety of roller coasters and other amusement rides along with a collection of animal exhibits and shows. In 1968 a twisting 12-turn 2.52-mile road course and a quarter-mile drag strip were carved into the rolling hills at the gateway to the Sonoma Wine Country. Since then race fans have been treated to some of the greatest racing found anywhere. Wine Country does not get more real than Sonoma Valley whose rich soils mark the birthplace of Californias wine industry. It is also the closest wine region to San Francisco just 45 miles north of the Golden Gate Bridge. BioMarin Pharmaceutical Inc. is a biotechnology firm based in Novato California. Founded in 1997 by Christopher Starr Ph.D. and Grant W. Denison Jr. with an investment of a USD1.5 million from Glyko Biomedical and went public in 1999. Schoolkid favorite where engineers once plotted ways to carve up and reroute Bay Area waterways using a gigantic working hydraulic model. Still used as a visitors and education center. Here come the earthquakes and asteroids! Cybernetic scrap metal sculpture gallery and cabinet of curiosities for artists Clayton G. Bailey and Betty Bailey. Includes artifacts from Clayton's Kaolithic Wonders of the World Museum.